HFVHigh Frequency Vibrodrivers with PTC Patented Variable moment Technology. HVStandard Frequency Vibrodrivers with PTC Patented Variable moment Technology. H&HDStandard Frequency Vibrodrivers with Fixed eccentric moment. 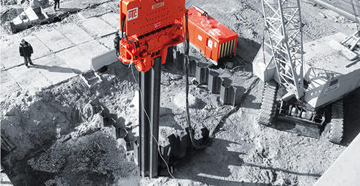 For more than 80 years PTC has mastered vibration technology and developed innovative pile driving solutions: The Vibrodrivers. When you have identified what is Vibrodriver range that best fits your jobsite, you need to find the vibrodriver model that offers you sufficient amplitude and centrifugal force to drive the profiles to the desired depth. WHAT VIBRODRIVER RANGE FOR YOUR APPLICATION? 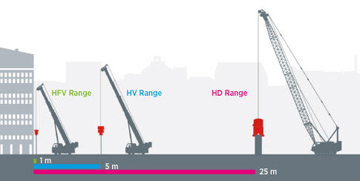 Please see the pictograph showing which PTC Vibrodriver range is better for your application, depending on the proximity of the vibrodriver to a vibration sensitive structure.